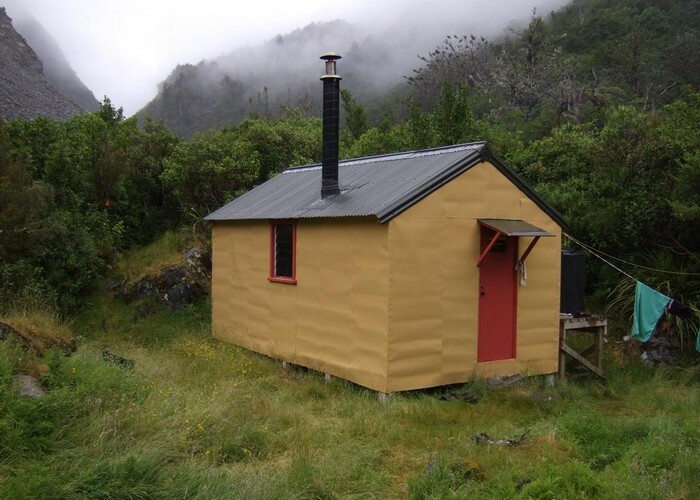 Smyth hut is an ex NZFS six bunk hut in the upper Wanganui River area in Westland. It is on the TL of the Wanganui slightly below but more or less opposite where it is joined by the Smyth River. About 200 metres below the hut on the TL edge of the river there are a series of hot springs. This hut is set amidst some rugged country with permanent ice fields around the tops. The steep & often crumbling slopes lead down to swift watercourses that contain some very large boulders. This country is inhabited by strong populations of thar and chamois which attract a regular flow of hunters to Smyth hut. A lot of the hunters fly in rather than walk! Added 5 January 2012 by glennjglennj. 1 revision 5 January 2012 by glennjglennj.